ENVELOPE : Gold Color 250 gsm Shimmery Finish Paper With Raised Gold Color Printing. 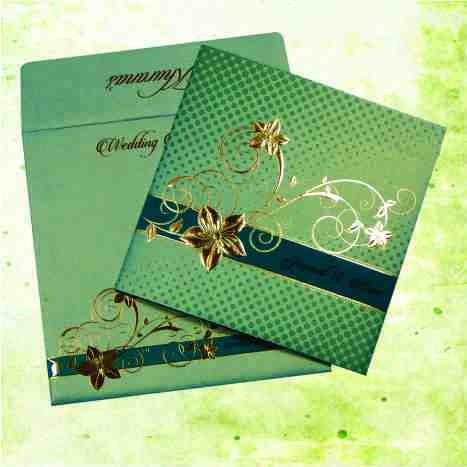 MAIN CARD : Blue Color Satin Fabric Paper With Gold Color Printing. Motif Printed In Gold Color Foil Printing, Decorated With Rhinestone/Kundan. Hi! Just wanted to say thank you so much for the great invitations. They arrived in excellent condition and everyone loves them. Thanks again for taking care of it so fast and with such good quality! We are definitely recommending you to everyone here!